Wynonna is clearly the leader of her group. She gives orders and they are followed without exception, even when the order is not what a team member wants to hear. I like that she is so in control. Wynonna is also quick with the snark and refuses to be tamed by anyone. She says what she wants and won't tolerate being told to watch her language. In fact, Wynonna won't tolerate any policing of her person whatsoever. 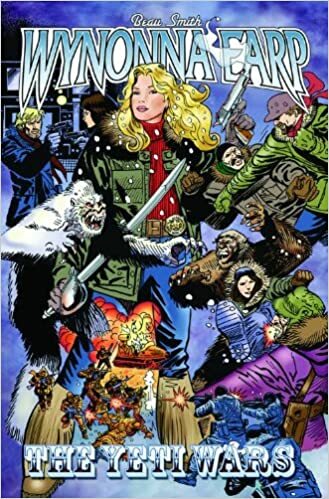 Yeti Wars has vampires, yeti, and what appear to be werewolves, yet somehow, despite all of this supernatural diversity, there's a lack of diversity among the humans. There are no noticeable people of colour and there are no LGBT characters. There's no justifiable reason for this erasure. There isn't much to say about Yeti Wars. It essentially moves from fight scene to fight scene with little character development and no discernible plot. Wynonna does manage to shut down the Consortium and capture Robidoux but the vampires are still out there plotting, leaving room of course for more of these boring comics. I highly suggest trying to borrow this graphic novel from the library rather than spending any money to purchase it. There's nothing exciting about the artwork or the characters. In short, Yeti Wars is easily forgettable.